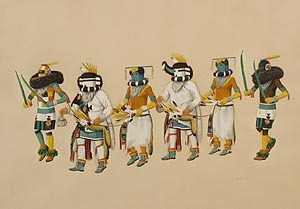 This exhibition focused on paintings from the Charlotte G. Mittler collection created by students who attended the Santa Fe Indian School between 1919 and 1945. Featured artists included Fred Kabotie, Velino Shjie Herrera, Allan Houser, Andrew Tsinjinnie, Pablitia Velarde, and Sybil Yazzie. 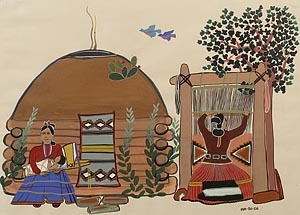 The Santa Fe Indian School has long been considered the birthplace of contemporary Native American easel painting. 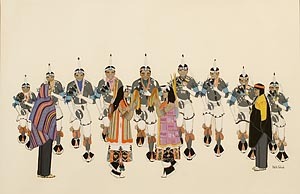 What has been written about the Santa Fe Indian School Studio and its place within the development of contemporary Native American painting concentrates largely on the patronage and the uniqueness of Santa Fe’s non-Native artistic and intellectual communities. The purpose of this exhibition was to give voice to a Native American perspective and to reveal how these paintings reflect Native American thought and life as seen through the eyes of the youth during the years between the two world wars. Untitled. Fred Kabotie (Nayayoma). Hopi. 1920-1930. 16 ½" x 22 ¾"
Basket Dance. Pablita Velarde (Te Tsan). Santa Clara. 1940s. 13 ¾" x 21 ¼"
Untitled. Narciso Abeyta (Ha So De). Diné. 1935-1936. 21" x 29 1/4"